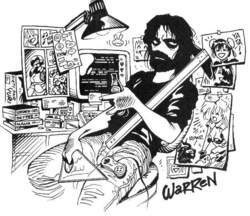 Adam Warren is an American comic book writer and artist who is most famous for his adaptation of the characters known as Dirty Pair into an American comic book, and for being one of the first American commercial illustrators to be influenced by the general manga style. He has also contributed to several Gen¹⊂3; comics, worked as writer and character designer for the Marvel Comics series Livewires, and done numerous freelance works. His two latest projects are Iron Man: Hypervelocity and Empowered.